Technology can replicate wonders, but only one can be an original. The original painting requires a large space. Most of these originals are four foot by five foot in dimension. The colors are pure and vibrant; like candy on a Christmas tree. The textures, which makes the original, are bold without restraint. Canvas are Master's Touch Masterpiece Collection, medium body. Acrylic paints are used and vary in viscosity and hue saturation, depending on the art piece. All acrylic paints are of a professional medium. There are other minor mediums used for some paintings, such as graphite and charcoal. 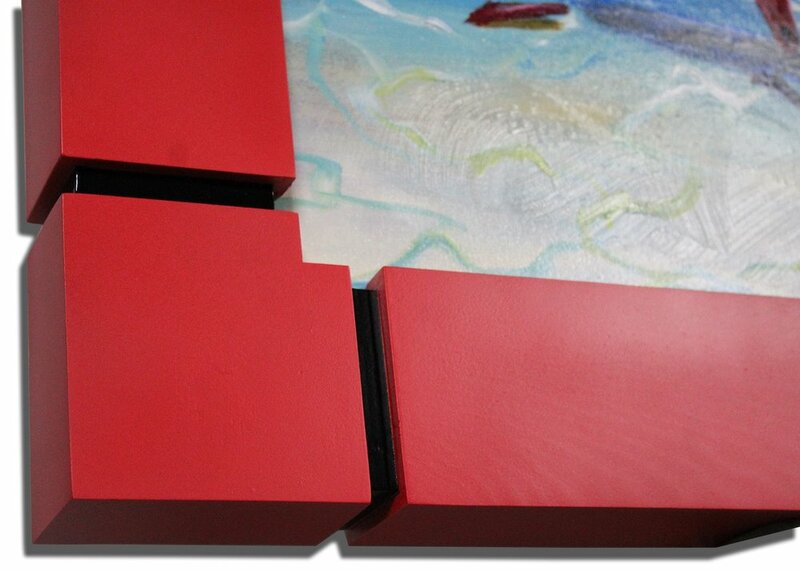 The paint is sealed with a minimum of two coats of a permanent liquitex, high gloss varnish. Shipping and handling costs are included in the price. Taxes may apply. Each Embellished Giclee is customized by the artist using the same acrylic paints and varnish as the original. This embellishment provides your art with that three dimensional feel, sometimes trumping the original. This Embellishment is something no technology can emulate, the artist personal touch. Following is a photo illustrating the details of an Embellished painting. It should be understood that each Embellishment will be different than what you see herein, they are never exactly the same. The artist takes liberties to several things in each individual embellishment. In short, if your really picky, let the artist know your wants in advance so he can accommodate. If you would like to see more of a certain color, or heavy embellishment simply communicate to the artist. Each original painting (4' x 5'), is "scanned" using the Betterlight system, capturing the best image technology has to offer. The artist personally works with the specialized scanning company (Image Quest), as shown in the photo, to ensure the highest standard resolution possible. The quality of materials being used ensure longevity of your art piece for generations to come. High quality archival canvas is used for the first substrate in which the ink is placed upon. After the ink is applied, a Sunset Satin Varnish Coating seals the art. This varnish has UV inhibitors and is non-yellowing. Finally this canvas is adhered to Gator Board, which gives great rigidity to the painting. The artist embellishments are applied using high quality paints, varnishes and gels to add texture. These materials bond with the Sunset Satin Varnish for a proper cohesive art piece that will last for decades, if not longer. Each Embellished Giclee comes with a custom frame. These frames are made by local master craftsmen in the KC surrounding area. The frames are one piece, eliminating the 45 degree corners. Each frame is carefully prepared for the best surface and edges possible. You will still have the occasional character marks, letting you know the frames are hand made; yet you may have to look closely to find them. The corners make the frame. They are bold, and yet elegant. Strong, but still soft. This design truly matches with the artwork style. The paint is an appropriate Satin finish. This provides a little gloss but not too much. The art must stand out first, the frame is to complement the artwork. The inset of the frame allows for proper depth of the canvas. No glass. The artist wishes to show off the art piece, as in the historic days. This allows the art to shine through and provides an original feel. Each frame is 2-1/4" thick, or off the wall. This provides massive texture to the location of which its placed. Each art piece comes with a Certificate Of Authenticity. This certification substantiates the materials used, seals the artist originality, and provides an exposition of the Embellished Giclee meaning. Shipping / handling/ taxes... what to expect ??? In short, only taxes would be added to the cost you will see in the Shop page. And that is only for Missouri. As Missouri is a nexus state. Meaning if you live in Missouri the artist is required to collect sales tax. However, if you live outside of Missouri the sales tax... is up to you. Expect 3-weeks from order to delivery. In short once you place your order a team of elves get to work preparing the delivery of your custom made artwork. Your art will arrive in a double layered cardboard shipping box, taped and strap bound. Inside, and adhered to the cardboard, will include special puncher resistant sheets. The art is cradled in a dense Polystyrene sheeting. Inside of that will be a plastic sheeting wrapped around the artwork for a moisture barrier protection. Within that, will be a museum quality archival sheeting that wraps the artwork, ensuring its protection to other materials. Also included will be the Certificate of Authenticity. If you are drop shipping to someone special and need a personal card or other special request, simply let the artist know. Additional details will be provided during your checkout. And you can always contact the artist in the Contact page to inquire about further information.